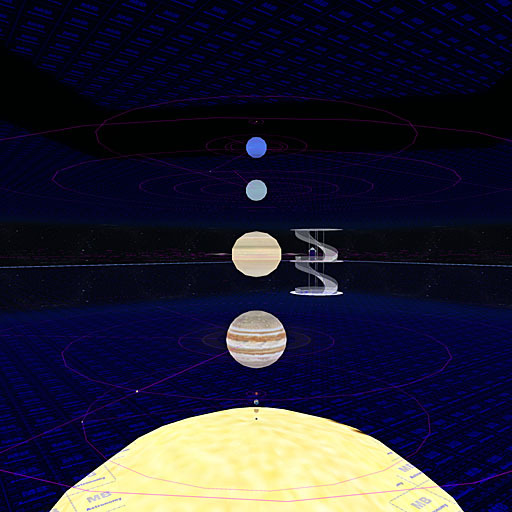 There is a new exhibition of the Sun, Planets, Major Moons & Orbits in the region Astronomy in Metropolis (hypergrid.org:8002:Astronomy). The exhibition shows all planets, ring systems, major moons, some other bodies, with surface textures, moon orbits, moon motions and rotations at a spatial scale of 1:100,000,000, meaning 1 cm in the exhibition is 1,000 km in reality, and a time scale for orbiting and rotating of 1 : 3,600, meaning 1 second in the exhibition is 1 hour in reality. The exhibition is in a skybox at 270 meters altitude, and can be reached from ground level by a teleporter pad at the observatory building, express elevators (sit and touch) or stairs in all 4 corners of the region. The big sign over the exhibition gives landmark and more information on touch. The region "Magnuz 8" in Metropolis ("hypergrid.org:8002:Magnuz 8") is a 2048x2048 m (8x8) varregion and was created as a test area for various automated and semi-automated landscaping tools. The terrain is script generated and one of the 1500 created that way and available in the region "Terrains". The 8192 trees were also "planted" by a script. Future plans for the region is a tour boat around the coast and into the many deep bays ("fjords") of the landscape, which was selected with that purpose in mind. Other plans are a scripted placement of buildings, actually similar to the "planting" of the trees, and more advanced routing of roads and railroad through the landscape. Ever since I started out in virtual worlds, I've enjoyed trying to create prototypical environments. Nature is a fascinating challenge in that respect, being both random and ruled. To find computer algorithms to mimic that requires quite a bit of both background research and trial and error. Most forests today are human planted and more or less mono-cultures of one major species, to rationalize the forestry. But a non-cultivated forest is much more varied. Different trees grow preferentially in different spots, often clustering together, depending on elevation, slope, humidity, acidity, soil and other factors. I've tried to mimic that, using a "planting" script taking several such factors into account. The result, even with the Linden "system trees", is an, at least in mind, rather pleasant experience. The landscape is varied and reminds some of an English park. To make the forests more forest-like, the density of trees should probably be 2-3 times higher than the present, but I enjoy the open landscape the present density gives, so I'll leave it as is for now. I have finally begun to clean up the "dump" region MB Estates in Metropolis (hypergrid.org:8002:MB Estates), moving some experimental builds and adding an impressive build containing an image display, some regional 3D statistics and a 3D statistic display showing the activity development in all public major OpenSimulator, past and present. The 3D display uses data compiled and originally presented by Hypergrid Business. It shows the number of active users the last 30 days, reported month by month, from May 2010 until today. It shows the data for the 164 grids which ever reported an active count bigger than or equal to 60, ordered by that count. The display is 7.2 x 8 x 10 m, built by scripts from data in a notecard, using 3513 primitives in 164 objects, and an additional 9 prims in the sign and optional rulers. The scale is 1 grid per 0.05 m north to south, 1 month per 0.1 m west to east, and 1 active per 0.001 m in height. Each grid has its own color code, and a matching hovering title, plus info on mouse hovering over it. The display shows both present major grids, like Avination, InWorldz, OSgrid and Metropolis, as well as past grids like Your Alternative Grid, Heritage Key, Alpha Towne and Meta7. It makes it easy to both get a general overview over development, as well as study details for single grids or selected time frames. 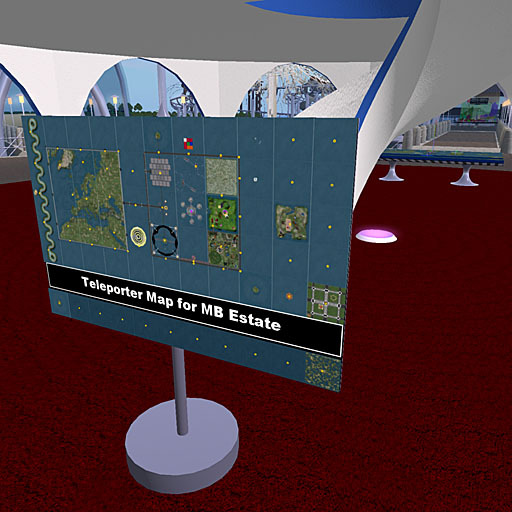 A project to create an auto-updated map over MB Estate, as a base for region visiting statistics, developed further into a teleporter map, now deployed in all 66 regions of MB Estate, and permitting fast and easy transport for anyone looking around. The map shows the present map-tiles, and also yellow markers for the location of all teleporters, except a magenta/purple marker for the location of the teleporter in the present region. I know this partly duplicates the viewer map teleport and the Metropolis teleport system, but for some reason, the scripted osTeleportAgent teleporting is both faster and safer than the other alternatives and the use of landmarks, with shorter waiting times and fewer failures. If I excluded varregions bigger than 1024x1024, I could teleport around the 60 remaining regions three full loops without crashing (180 teleports in approximately one hour), which is far better than if I use the other teleport methods or try to fly around. Anyway, that was my weekend work, and hopefully it will be useful to some visitors. The present version of the Teleporter Map script is hardcoded to MB Estate, but the next time I need to update something, jumping around 66 regions and exchanging 66 teleporters, I'll probably get frustrated enough to make it group configurable, and thereby also easily adaptable to other clusters of regions. I'll probably use the same system that has been working reliably for the 200+ video screens in region Media for a long time now, with the script reading a UUID for a common configuration notecard from a web URI. Once that's done, and I've tidied up and documented the script some, I'll gladly make it available for general use. The script actually even builds the map automatically, in the MB Estate case rezzing, linking, formatting and texturing 132 prims, so it could save a lot of work. I collect a lot of information from the OpenSimulator metaversum, both in general, software development, various grids, my home grid Metropolis in particular, and Maggie's and my cluster of regions (the MB Estate "mini continent") in detail, and make various analyses of the data, to better understand what is happening and where things might be heading. I began compiling detailed statistics for MB Estate in the beginning of 2015, and in the now 8 months since then, its 66 regions have had in total 3035 visits (1775 local and 1260 hypergrid) from 771 unique visitors (424 local and 347 hypergrid), spending 23640 minutes (12023 local and 11617 hypergrid). 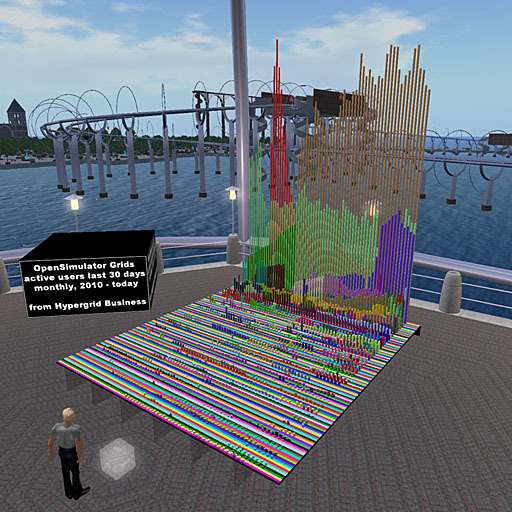 The visitors originate from 99 unique grids and standalones, the largest ones in terms of time spent being Metropolis (50.8%), OSgrid (16.4%), and Great Canadian Grid (14.0%). They also represent 37 countries on 6 continents, the largest ones in terms of time spent being USA (29.6%), Germany (28.7%), Canada (7.9%), The Netherlands (6.4%), The UK (5.2%), and Australia (5.1%). These data exclude the region residents Magnuz and Maggie Binder. About half (50.6%) of the unique visitors have spent more than 10 minutes in total at MB Estate, 1/3 (33.5%) more than 20 minutes, 1/4 (23.3%) more than 30 minutes, 1/6 (18.3%) more tham 40 minutes, 1/7 (14.3%) more than 50 minutes, and 1/8 (12.5%) more than 1 hour. The most popular target regions are Terrains (59.3% of time spent, 66.5% if its affiliate regions MB Sea 65 and Terrains 1-10 are included), Astronomy (4.8%), Maggie's (4.8%), Railway (3.7%), Map (3.7%), Media (3.3%), Europe C (2.7%, 3.9% if the 8 other Europe regions are included), Earth (2.0%), Maze (1.6%) and Maggie (1.3%). Even if the visitor stats may seem impressive at first, 23640 minutes (394 hours or 16.4 days) in the 244 days measured means an average concurrency (simultaneously logged in users) of 0.067, compared to the Metropolis grid average of at present about 20. If the time spent by Magnuz and Maggie Binder is added, the total time spent increases to 81424 minutes (1357 hours or 56.5 days) and the average concurrency to 0.232, or about 1.2% that of Metropolis. Also, with the count of active unique users the last 30 days at MB Estate having peaked at 184, it means it actually has brushed shoulders with rather well-known grids like ScienceCircle (184), Naras Nook (172) and Anettes Welt (171), in this respect. To me, the above figures are not meant to boost how grand the MB Estate continent is, but rather to get a grip on what some of the other statistics numbers I see really means. It shows to me how small and fragile the OpenSimulator ecosystem still is. But it also shows how important the hypergrid has become and how international the metaversum is, even seen from the narrow perspective of the few hobby regions Maggie and I run. So do you see things going well overall? Minethere Always hat geschrieben: So do you see things going well overall? To be honest, I don't think I would become very popular if I presented my analyses of the overall OpenSimulator development. I've already been more or less decapitated once for doing it for a grid, which has now shrunk from 9500 to 800 in unique users the last 30 days (Metropolis has about 2900), and from 250 to 8 in average concurrency (Metropolis has about 19). So, let's stay happy, playing around with OpenSimulator as is, and stick to the Hypergrid Business "truth" that everything is great and growing, OK?